Cline Cemetery is also known as Kline, Klein, or Weyand. I thought about including the report from the L'Anguille Valley Memorial Association here, but decided to paraphrase pertinent parts and add my own notations. At the time LVMA was surveying this cemetery, April 2 - July 26, 1943, Whitsett considered what we call Cline today and the cemetery called Royal Center as one cemetery. 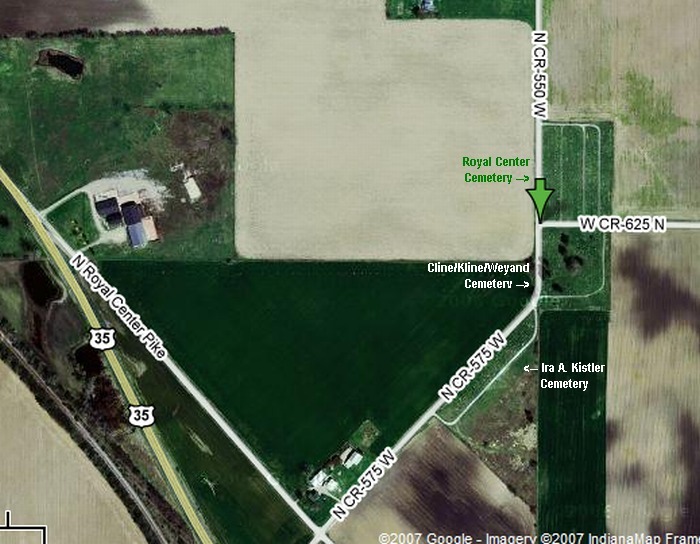 Today each cemetery is marked by its own signage and a new cemetery called Ira Kistler was opened directly south. Cline Cemetery is located south of Royal Center , Indiana , just off US 35, approximately one mile east on county road 575 W. It's located between the Kistler and the Royal Center Cemeteries . The cemetery was originally known as the Kline Weyand Cemetery . Later the name was changed to the Cline Cemetery . The cemetery is laid out in three sections; right, middle, and back. The markers in the right and back sections are laid out from left to right, front row to back row. The middle section is laid out from right to left, front to back. Most of the listings were taken with permission from a book published in 1997, by Vicki Bridge , called Cline Cemetery at Royal Center , Indiana . The book tells about history of Boone township, Evolution of American Cemeteries, the Cline Cemetery it's markers and monuments. Vicki tells about some of the epitaphs, lists the veteran markers, and gives some suggestion as to why the cemetery's name was changed. She also writes about legends and folk-lore of the cemetery and Royal Center . The Royal Center Library has a copy of this book and can tell you how to acquire one. I've purchased a copy and would highly recommend it to anyone is researching Royal Center and the families that have lived in the area. All photographs are copyrighted by Ed Castor and may be used for personal use only.